Immigration is a human right! Open the damn borders! 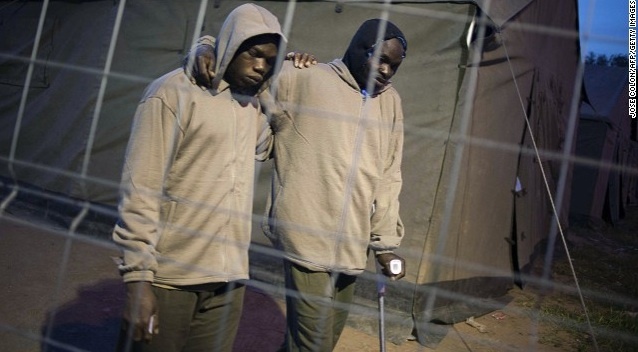 This photo is of two African immigrants who on March 18th made it past the 20-foot chain-link fence between Morocco & Melilla, an outpost of Spain on the coast of northern Africa. Because the detention center already has triple its capacity of immigrants, the Spanish Red Cross set up additional tents (seen in the background). The photo is posted not to evoke pity–a patronizing emotion–because immigrants are among the toughest, most determined people on the planet. It is posted because the faces of these young men express the fear, trauma, & ordeal of undocumented immigrants routed by neoliberal barbarisms, forced to leave their families & countries, travel thousands of often treacherous miles, risk their lives & limbs simply to find work. Our fullest solidarity with them. Immigration is a human right!